RCIA stands for the Rite of Christian Initiation of Adults, it is journey to help inquirers fully understand the level of commitment and deepen their knowledge and clarify any doubts they may have before deciding to get baptised. It prepares adults to receive the sacraments of Christian initiation (Baptism, Confirmation, Holy Eucharist). Companions - Companions primarily journey with the inquirers or candidates in the RCIA journey. They may also serve to some extent as a personal mentor and a representative of the faith community. Companions may or may not be members of the local parish community, but should be members of the Catholic Church, and are active in practicing their Catholic faith. Service Team Members - Service Team Members have a range of duties; preparing food, executing logistics, drafting communication materials, etc. 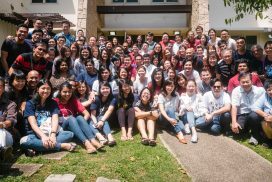 Essentially, the service team is there to support the Spiritual Director of RCIA (The Parish Priest in charge of RCIA) in ensuring that the weekly sessions run smoothly and that the inquirers/candidates have someone to turn to in case of uncertainty. On top of the weekly involvement, the service team, also supports parish activities, plans the retreat, oversee canteen duty, etc. The role of a Service Team Member is one that is commitment heavy. We start in June, and the journey concludes with baptism being celebrated the following year at the Easter vigil. The year long journey is anchored by weekly sessions held on Tuesdays, from 8.00pm - 10pm, at the St. Francis Xavier room (Level 2, Parish Centre). A rundown of what the journey looks like from start to end - A typical session starts off with a prayer followed by a short time of praise and worship. The designated speaker (either a Priest or a guest speaker) will then delve more into the topic of the week. Depending on the flow of conversations and time limitations, there may be sharing in break-out groups where inquirers, candidates, companions and facilitators get to participate. As an Inquirer, this is a time for you to ask questions, be introduced to Gospel values, and experience the beginnings of faith. If you feel that you are ready and would like to take the next step, this period concludes with the celebration of the Rite of Acceptance into the Order of Catechumens. As a Catechumen, this is a time for your faith to be nurtured, attending sessions to learn about Catholic faith and teachings. If you feel that you are ready and would like to take the next step towards initiation, this period concludes with the celebration of the Rite of Election/Enrollment of Names where there will be a diocesan-wide celebration of Catechumens. As an Elect, this period (usually during Lent) preceding your initiation is meant to be a time of reflection, intensely centered on conversion, marked by the celebration of the scrutinies and preparation for the rites of the Sacraments of Initiation. During this time, you are still free to make a final decision whether you wish to be fully initiated into the church. Now that you have been initiated, as a neophyte, you are fully a part of the community. This is a time for deepening of your faith. If you'd like to help out as companion or service team, simply pick up a form from the SFX General Administration Office or download it below and submit it to the Administration Office or drop us an email.